Club Penguin Cheats by Mimo777 Club Penguin Cheats by Mimo777: New EPF Message from Director: August 8! Director is always a little late, don't you think? 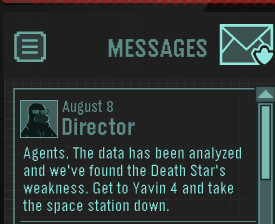 I've already destroyed the Death Star, have you? Yeah, Mimo. No wonder the "Editing" screen was on. It's the BRB screen with the brown puffle on the computer. We need Rsnail back!! With teen beach movie and all that im thinking of leaving CP! Look through the telescope for a surprise! !